Book reviewer, Theresa Smith, and I dig deep to chat all things books and literature in this recent interview. We may also veer into shoe territory… because everyone knows, a good conversation is never complete without the mention of dancing shoes. Click HERE to check out Theresa’s other wonderful reviews and interviews. 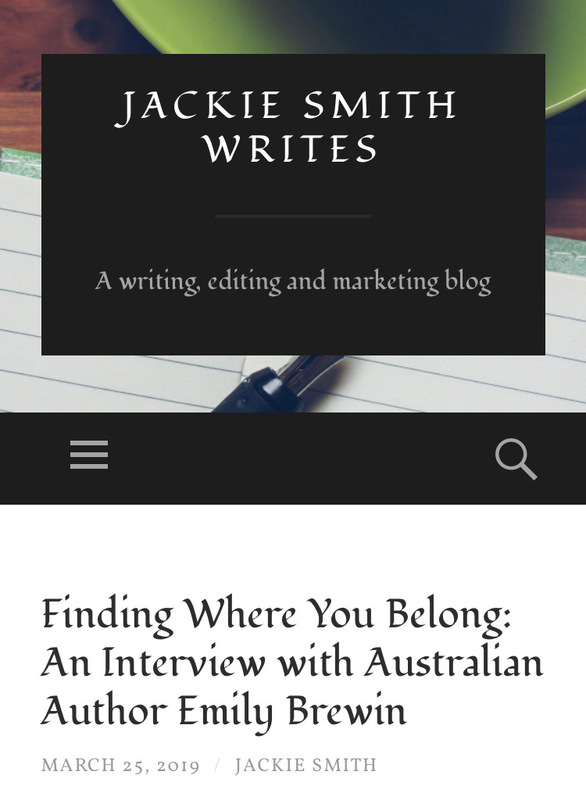 Book blogger and wordsmith, Jackie Smith, interviewed me recently about the ‘nitty-gritty’ of writing a book and the story behind my new novel, Small Blessings (released in Feb this year). Click HERE for a peek at our full interview, and be sure to check out Jackie’s other insightful author interviews while on her website. Join me and the wonderful folk from Turn the Page bookstore for an afternoon of wine, nibbles and literary chats this Sunday the 31st of March at Bimbadeen Cafe on Philip Island. 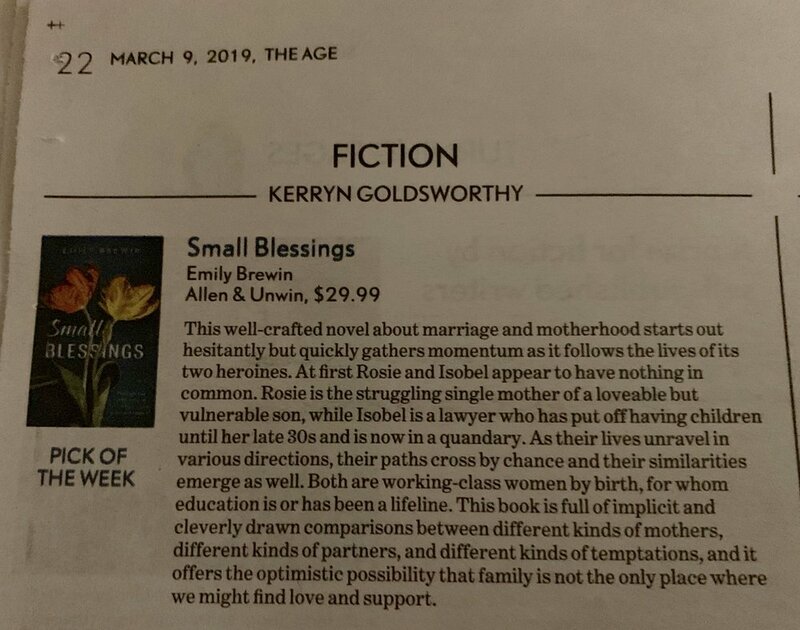 Small Blessings was The Age and The Sydney Morning Herald’s pick of the week recently. 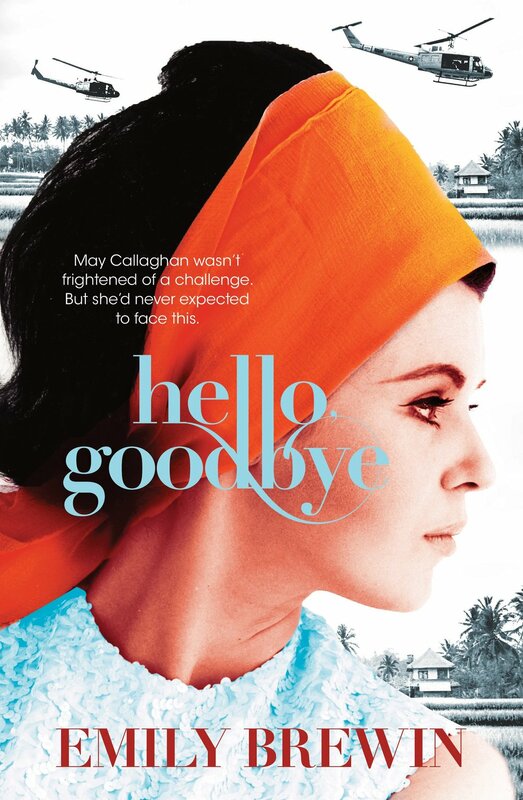 Read all about it in Kerryn Goldsworthy’s wonderful review, below! Lately, I have been thinking about the power that comes from allowing ourselves and those around us to be vulnerable. But being vulnerable in the age of social media can be difficult. My International Women’s Day piece discusses this, and the humanity that comes from letting our guards down. To read this and the wonderful insights of other A&U authors, click HERE. 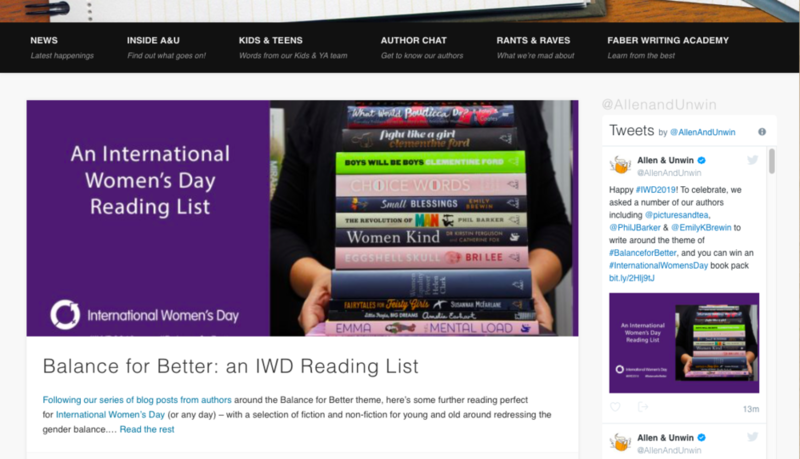 I recently wrote about four books that changed me for The Age and The Sydney Morning Herald. A good book is one that transports me to another place and brings me back a little wiser and a little more openhearted. 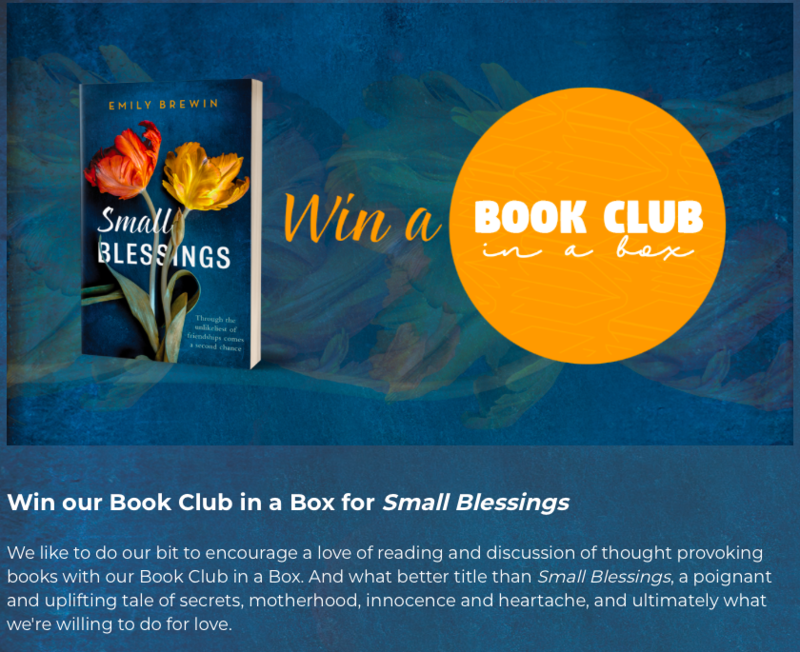 Small Blessings is Allen & Unwin’s book club pick of the month! To celebrate, they are giving away a Book-Club-In-A-Box pack, which includes ten copies of the novel, wine and snacks. The pack is perfect for existing clubs and for those new to the game. For your chance to win a pack, click here. I was thrilled by this recent review of Small Blessings by Theresa Smith Writes. It is honest and heartfelt, and shows a real understanding of the book. It also left me quite teary… in a good way. Small Blessings was launched into the world at Readings bookstore last Wednesday with the help of talented Melbourne broadcaster, editor and writer, Mel Cranenburgh, and the creative director of Move. Create. Dance, Anne Gollan. It was wonderful to see so many friendly faces in the crowd and at the signing table. Most definitely, it was a night to remember! Small Blessings launch at Readings bookstore in Carlton. Melbourne has an array of brilliant bookstores, and yesterday I had the pleasure of visiting some of them to sign copies of my brand spanking new novel, Small Blessings. It was lovely to meet so many passionate booksellers and to see my book finally on the shelves. Thanks to Readings, Collins Booksellers in Moonee Ponds, The Avenue Bookstore, Jeffreys Books and Dymocks for having me. I am sharing my journey to publication, complete with hot tips, at Coburg Library on February 11th from 7-8pm. It’s a free event. Go to: https://www.moreland.vic.gov.au/libraries/library-events-and-activities/readmore-project/Journey-to-publication-/ to book your place. Well, the day has finally arrived… my new novel, Small Blessings, hits stores and I couldn’t be more thrilled! A HUGE thank-you to all the wonderful folk who have helped make this happen - Annette Barlow and the team at Allen & Unwin and my agent, Gaby Naher. Not to mention my fabulous family and friends. The book wouldn’t be here without the hard work and support of you all. Visit your local bookstore to get your hands on a copy, or go direct to Allen & Unwin here. Enjoy, and let me know what you think, via my contact page. Perth Tonight’s, Chris Ilsley, interviewed me last week to discuss the motivation behind the characters and plot of my new book, Small Blessings. Click here to listen to the full podcast interview. I was lucky enough to be interviewed recently by iconic Melbourne radio duo, Jan Goldsmith and David McLean, on their 3CR show Published or Not about my new book, Small Blessings. A huge thanks to Margot Lloyd and the SA Weekend Magazine for this review of Small Blessings. Small Blessings is out soon and I’d love to you see you at its launch at Readings bookstore in Carlton on February the 13th. 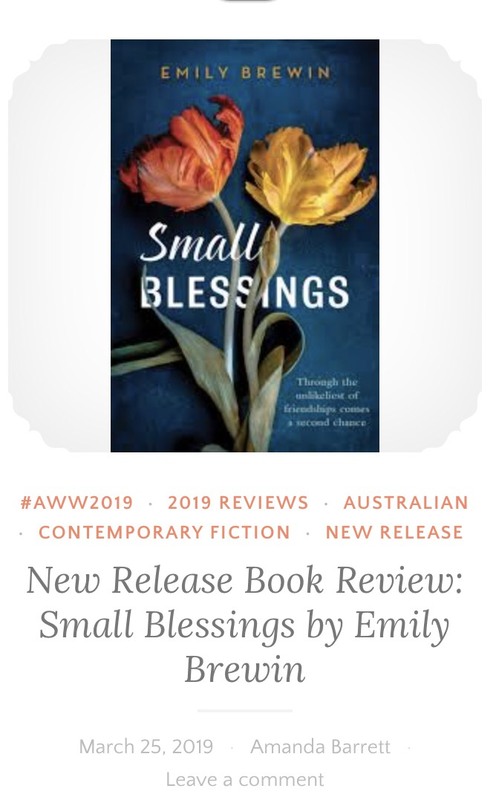 Small Blessings was recently voted by library staff across Australia as one of February 2019’s top ten new release books. Needless to say, I am thrilled and humbled to see it nominated alongside so many great upcoming titles. An especial high five to my friend and fellow author, Sonia Orchard, for her book, Into the Fire (out Feb 2019 with Affirm Press). A BIG thanks to Margaret River Press and to judges, Donna Mazza, Luke Johnson, Camha Pham and Michelle Cahill for shortlisting my story, A Twist of Smoke, in the 2019 Margaret River Short Story Competition. I look forward to seeing it in print alongside the other shortlisted tales. A massive congrats also to first and second place winners, Kit Scriven and Catherine Noske, and to Rachel McEleney’s for taking out the Southwest Prize! Keep an eye for the collection… coming soon!